4.1 Humans transfer and transform energy from the environment into forms useful for human endeavors. The primary sources of energy in the environment include fuels like coal, oil, natural gas, uranium, and biomass. All primary source fuels except biomass are non-renewable. Primary sources also include renewable sources such as sunlight, wind, moving water, and geothermal energy. 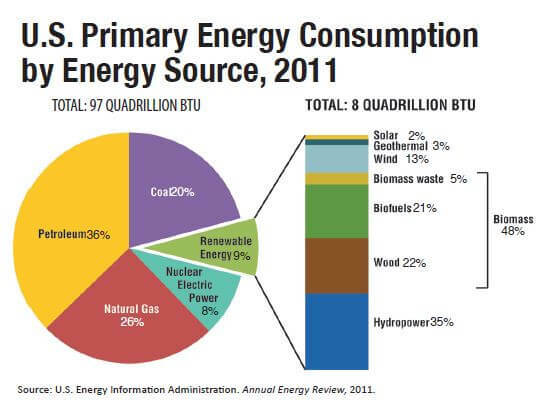 Text from image: TOTAL: 97 QUADRILLION BTU; Coal 20%, Renewable Energy 9%, Nuclear Electric Power 8%, Natural Gas 26%, Petroleum 36%. TOTAL: 8 QUADRILLION BTU (Renewable Energy); Solar 2%, Geothermal 3%, Wind 13%, Biomass waste 5%, Bio-fuels 21%, Wood 22%, Hydropower 35%; Biomass 48%. Source: U.S. Energy Information Administration. Annual Energy Review, 2011. 4.2 Human use of energy is subject to limits and constraints. Industry, transportation, urban development, agriculture, and most other human activities are closely tied to the amount and kind of energy available. The availability of energy resources is constrained by the distribution of natural resources, availability of affordable technologies, socioeconomic policies, and socioeconomic status. 4.3 Fossil fuels and bio-fuels are organic matter that contain energy captured from sunlight. The energy in fossil fuels such as oil, natural gas, and coal comes from energy that producers like plants, algae, and cyanobacteria captured from sunlight long ago. The energy in bio-fuels such as food, wood, and ethanol comes from energy that producers captured from sunlight very recently. Energy stored in these fuels is released during chemical reactions, such as combustion and respiration, which also release carbon dioxide into the atmosphere. 4.4 Humans transport energy from place to place. Fuels are often not used at their source but are transported, sometimes over long distances. Fuels are transported primarily by pipelines, trucks, ships, and trains. Electrical energy can be generated from a variety of energy resources and can be transformed into almost any other form of energy. Electric circuits are used to distribute energy to distant locations. Electricity is not a primary source of energy, but an energy carrier. 4.5 Humans generate electricity in multiple ways. When a magnet moves or magnetic field changes relative to a coil of wire, electrons are induced to flow in the wire. Most human generation of electricity happens in this way. Electrons can also be induced to flow through direct interaction with light particles; this is the basis upon which a solar cell operates. Other means of generating electricity include electrochemical, piezoelectric, and thermoelectric. 4.6 Humans intentionally store energy for later use in a number of different ways. Examples include batteries, water reservoirs, compressed air, hydrogen, and thermal storage. Storage of energy involves many technological, environmental, and social challenges. 4.7 Different sources of energy and the different ways energy can be transformed, transported, and stored each have different benefits and drawbacks. A given energy system, from source to sink, will have an inherent level of energy efficiency, monetary cost, and environmental risk. Each system will also have national security, access, and equity implications.